A Symposium in honour of Professor Dawa Norbu organised by Tibet Forum JNU in collaboration with Tibetan Review at JNU on April 7, 2015. (TibetanReview.net, Apr08, 2015) – A symposium was held in New Delhi on Apr 7 in honour of late Professor Dawa Norbu who had pioneered exile Tibetan scholarship in modern academic fields. He was best known initially for his editorship of the Tibetan Review magazine in the 1970s and, later, as a professor in Central Asian Studies at the Jawaharlal Nehru University (JNU) for much of the rest of his life. JNU Vice Chancellor Prof SK Sopory was the Chief Guest while the Dalai Lama’s New Delhi-based Representative, Mr Tempa Tsering, chaired the inaugural session. The latter, a schoolmate of the late scholar, recalled the latter’s academic vigour and enthusiasm, and his dedication to his quest for knowledge right from an early age. Prof Sopory, who was a faculty member of JNU when Prof Dawa Norbu was enrolled as a student in the University, recalled the admiration the latter inspired in his peers with his deep inquest into his research work. 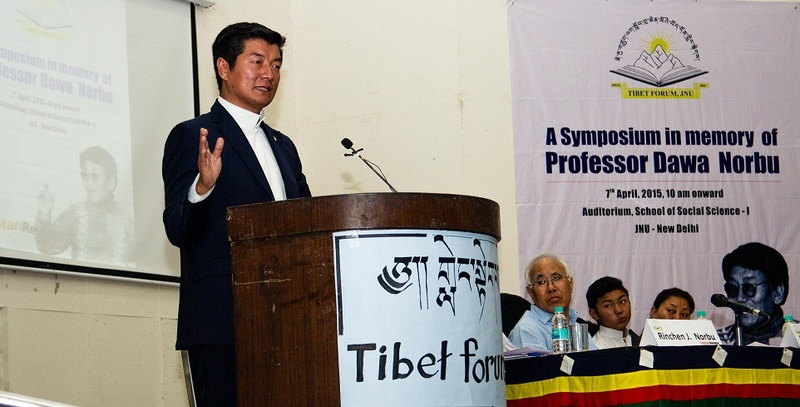 The head of the exile Tibetan administration at Dharamshala, Sikyong Lobsang Sangay, who gave the keynote address, recalled the time he had spent with Prof Dawa Norbu at Harvard University. He described him as a carefree, amiable and deeply knowledgeable person. He felt that the late scholar was, unfortunately, misinterpreted in the Tibetan society; that contrary to false beliefs, he was deeply influenced by Buddhism, was respected by the Dalai Lama, and a staunch patriot in the Tibetan national movement. Dawa Norbu’s son, Rinchen Jamyang Norbu, delivered an emotional speech about a father who deeply cared about his family, was strongly dedicated to his academic pursuits and had ardent love for his nation. The symposium’s first of the four sessions, chaired by Prof Siddiq Wahid, a Senior Fellow at the Centre for Policy Research, New Delhi, focused on remembering Prof Dawa Norbu’s works by his former students. Presenting a paper on “The Tibetan Historian Dawa Norbu: A Man of Rationale, Humour and Wisdom”, The first speaker, Prof Priyadarsi Mukherji of the Chinese and Sinological Studies, JNU, reflected on the late professor’s accomplishments as a historian of the Tibetan Movement, his objective critique of the history that interspersed between pre-1959 and post 1959 until the past Century. Prof MN Rajesh, Associate Professor in History, University of Hyderabad, presented a paper on “Cyber encounter with Tibet: An Open Moment?” He delved into the important yet often not clearly understood notion of cyber security and cyber consumerism which the Chinese government uses so effectively. He said that traditional Tibetan indigenous techniques and knowledge were being patented and sold for huge profits by the Government and MNCs while the cyber space was being curtailed through the so-called Great Fire Wall of China. And Dr Satish Kumar, Head of the Centre for International Relations of the Central University of Jharkhand, presented a paper on “Tibet Factors between India and China Relations”. The theme of the second session, which was chaired by Prof Srikanth Kondapalli of the Centre for East Asian Studies, JNU, was “Issues of Culture and Sino-Tibetan Linkages”. Geshe Lhakdor presented short documentary on the Library of Tibetan Works and Archives at Dharamshala, of which he is the Director. He spoke about the library’s importance in the preservation of ancient Tibetan manuscripts and artefacts brought at great peril from Chinese ruled Tibet and its role in the propagation of Tibetan culture, heritage and knowledge through books, research centres and interaction among Tibetologists across the world. Mr Thubten Samphel, Director of Tibet Policy Institute under the exile Tibetan administration at Dharamshala, presented a paper on “Tibetan outreach to the Chinese”. He spoke about the growing bond of friendship and development of common interests between Chinese and Tibetan peoples in the context of Buddhism, Tibetan culture and language. He believed that the increasing rationale behind the Middle Way Approach of the exile Tibetan administration could signal a breakthrough in Tibet-China Relations. The theme of the third session, chaired by Prof Rakesh Gupta, a former Professor at the Centre of Political Studies, JNU, was on the “Study of Contemporary Issues of Tibet- Politics and Security”. Prof Kondapalli, who spoke on “China’s Foreign Policy and India”, traced the evolution of relationship between India and China since the Communist party’s takeover at Beijing in 1949, the varied nuances related to its approach towards its South Asian neighbours, and the centrality of Tibet in the discourse of China-India foreign Policies. Professor SD Muni, Distinguished Fellow at the Institute for Defence Studies and Analysis, spoke on “Coping with China in South Asia”. He introduced the participants to the approach being followed by China to secure its interests in south Asia over the years, its conflict of interests with India over the region and the strategic implications of such a conflict to both India and the whole region. And Dr Yeshi Choden, Associate Professor at the Centre for International Politics, Organisation and Disarmament at JNU, presented a paper on “The Tibet issue at the United Nations”. She felt that the Tibetan issue was receiving increasing attention at the UN General Assembly, that the various resolutions passed by the UN had pressured the Chinese Government to change its stance on the Tibet human rights issue, and she spoke about follow-up actions taken in the various organs and bodies of the UN. The symposium’s final session, the valedictory function, was chaired by Prof Renuka Singh of the Centre for Study of Social System, JNU. Mrs Madhuri Santanam Sondhi, Director of the ML Sondhi Institute of Asia Pacific affairs, spoke about the late Prof Dawa Norbu through memories of her late husband Prof LM Sondhi of JNU. She remembered him as an enthusiastic young man from his early age. The symposium, held in the JNU’s Social Sciences auditorium, was jointly organized by the university’s Tibet Forum and the Tibetan Review publication. The late professor’s wife, Rinchen Lhamo, lighted a traditional Tibetan Lamp at the beginning of the event, while his other son, Longchen Norbu, was also present. The organizers hoped that that the symposium, held to honour the memory of late Prof Dawa Norbu and his valuable contributions to the field of Tibet studies, would stimulate further progress among scholars. As Indian saying goes, “There is just waiting period; No darkness in God’s Temple” (Bhagwan Ki Garme Dher He Magar Undher Nahin), it has taken a while, nonetheless, a very befitting symposium organized at JNU in honor of the late Professor Dawa Norbu la. I applaud all the organizers, eminent speakers, family members, and audience who made the event successful. I have had the honor to befriend late Professor Dawa Norbu la while he taught at JNU and sojourned at the Tibetan Library (LTWA) in Dharamsala some summers for research and get away from Delhi heat. As I read about the symposium in honor of Professor Dawa Norbu la, fond memories flooded my mind. I take this opportunity to share one or two here to honor Dawa Norbu la and our friendship. He was greatly interested in Buddhism. During his research sojourn at LTWA in Dharamsala, we did our regular evening walk through the road winding down and snaking around Mentse Khang and talked about Buddhism and research methodology. He would ask me questions about topics and ideas in Buddhism including emptiness and I did my best to explain the ideas and give responses to him based on my limited knowledge. In return he would explain and respond to my interest and questions about social scientific research methodology. Our intellectual and critical thinking exchanges benefited us mutually. I found him deeply rooted in his faith; he did his rosary with mantras and I remember circumambulating Mahabodhi Temple during Kalachakra (1985?) when he was a bachelor. When he visited Dharamsala for summer sojourn Rinchen Lhamo la accompanied him and cooked for both of us. Rinchen Lhamo la loved him dearly and dedicated herself to his life and supporting his academic vision and work. Often she sat quietly in a corner of room while Dawa Norbu la was single-pointedly involved in his writing at the desk. I would simply sneak in and out because Dawa la could not be interrupted doing his writing. He had amazing concentration and discipline; a great lesson for someone like me. Dawa Norbu la was also a very down to earth man. When I was young, my late Pala told me a story about Dawa Norbu la when he was the editor of Tibetan Review. My Pala was amazed by his love of reading and how simply Dawa Norbu la lived despite his reputation. A tall image of Dawa Norbu la was erected in my mind by the story and his reputation. Many years after as a young adult, I had my chance to get to know Dawa Norbu la. He was a brilliant man, but I also found him to be an unassuming person. He lived Gandhiji’s philosophy: “Simple Living, High Thinking.” Dawa Norbu la invited me to his home on the new campus of JNU tucked into forest and solitude and at my request he even took a bus to another stop to pick me up because I was timid to catch buses by myself alone to an unknown campus. He and Rinchen la treated me to a sumptuous home cooked lunch and we had good conversations. Later he walked me to the bus stop and said good bye. Unfortunately, that was our final good bye for I got stuck in USA doing my Ph.D. in communication and in the meanwhile Dawa la left us so soon. My stories date back to a time when his both lovely sons – Longchen Norbu la and Rinchen Norbu la were not even born. I hope one of these days I get to meet Rinchen Lhamo la and the family, and together we can remember him sharing our intimate stories. I agree with our Sikyong’s remark that Professor Dawa Norbu la was misunderstood in our diasporic community as having no faith in Buddhism, and challenging His Holiness’ leadership. To the best of my knowledge and knowing him intimately, none of that is true. As a matter of fact, he kept his faith and interest learning about Buddhism and deeply respected His Holiness the Dalai Lama and His Holiness Sakya Trizin. I fondly cherish our friendship and memory and I am grateful for all the wisdom he shared with me. I am interested to watch Professor Dawa Norbu la’s sons to follow his foot steps and make their remarkable contributions to Tibet and the world at large. If you see it fit to publish in TR, please feel free to do so with needed edit. Thank you.